Hannah Goes West: …And There Goes Ontario! 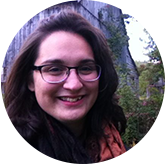 I’m so happy to have Hannah MacDonald here on the blog as a guest writer. This is the second in a series she’s writing about her move “Out West”. The first piece is here. 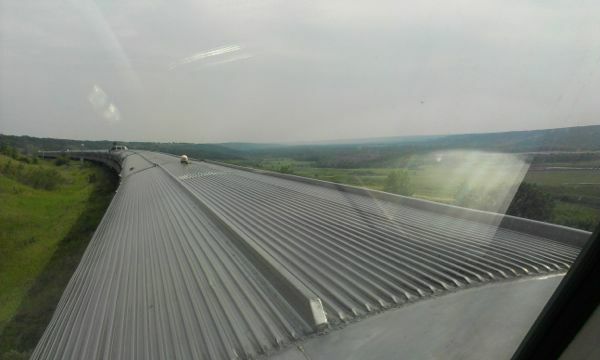 Although I am almost settled here into Edmonton life, there’s one aspect of my move that deserves attention: the train! Whenever I would tell someone, “I can’t believe I’m leaving so soon. I’m taking the train out on the 11th!”, the reaction would be either, “You’re taking the train? How nice!” or “You’re taking the train? WHY!?”. Both are very fair commentary as the train is often seen as that quaint but generally ineffective mode of transportation in our expansive country. Passing through Sackville, where I lived while in university. Having taken the train 4,464 kilometres over 89 hours from Truro, Nova Scotia to Edmonton, Alberta, I would recommend it to anyone. Really. There’s something for everyone. And it wouldn’t hurt if everyone took some time to just. slow. down. First off, the best and worst part of the train is certainly the pace. Taking the train takes time. You need to allot an amount of time that most people are not willing ro able to do. However, on the eve of my transition, this pace was just what I needed. I met a few folks who considered it “the first part of my vacation.” Travel wasn’t a slog to get home; it was a way of relaxing and getting refreshed to meet friends and family. Other folks wrapped up loose ends for work while still being able to walk and think so they were ready to hit the ground running when returning to work. I was making a move across the country. 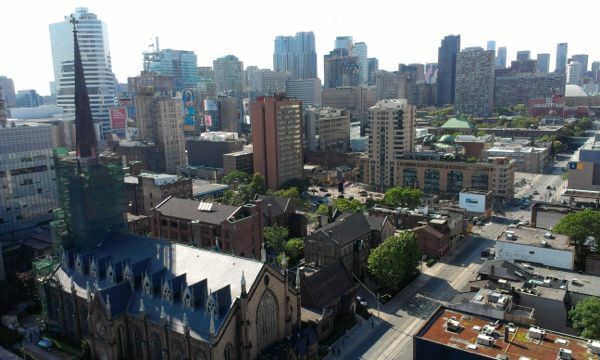 Instead of arriving on a plane ten hours after leaving home to a new province, a different ecosystem and a strange city, I wanted to experience my move. The real geographical and emotional move. A clever friend of mine told me before leaving that “you’ll never have that moment. You’re always expecting it, but it never comes”. That major-life-decision moment of realization “oh, yes, I’m moving to a new city across the country. I feel differently now!” I’ve made a few major moves in my young life. This one was perhaps the more daring I’ve made and I wanted to fully experience and examine it. My friend was right. There is no moment. But that’s where the train helped slowly settle into the idea. Civilized omelette breakfast in the dining car. As the train pulled out of Union Station in Toronto, a kindly university professor asked me, “So, where are you heading”. I suppose when a young woman coming from the east answers this question with “Edmonton, Alberta”, people assume one of two things: work or love. Fair enough, I was going for the latter. It was a lovely chat, but I explained my story awkwardly – providing too few and too many details in the wrong order. I was trying to justify my move, as though I was talking to someone from home, but now… to a stranger? I slowly condensed my story to the important details. I created the tale I wanted to tell, justified by me. My little love story was refined after a few tellings, with a certainty arriving in the repetition. (Don’t worry; these were real conversations not blubbering monologues.) By explaining to strangers, who knew me as well as the conductor, it allowed me to distill my story to the barebones, the simple truth. And it really is quite simple. Yes, the train has just the right pace. To see the country move by. To settle into a new story. Checking out our “wheels” in Foleyet, ON. 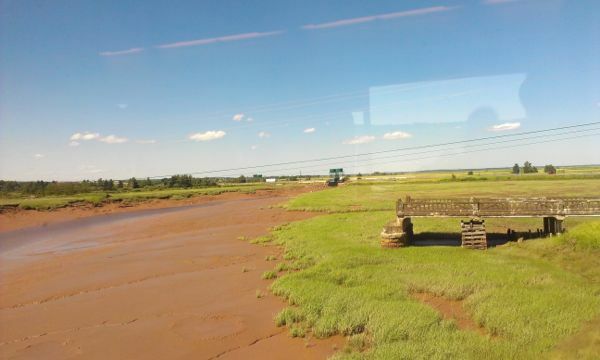 Many people were like myself, trying out the train for its novelty and discovering how it really is a ‘more human way to travel.’ Via Rail makes that claim and it certainly is true. Even traveling in coach, I arrived feeling much more human than any other mode I’ve tried. I was well-stretched, mostly well-rested, and ready to take on Edmonton. 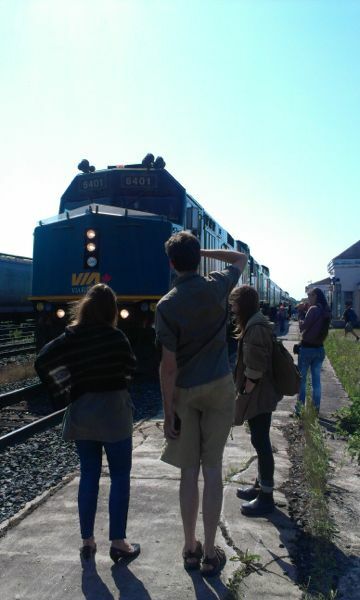 Beyond feeling human, the cross-country train encourages and refines human interaction. For one, the staff is wonderful. With everything from seat changes to beer selections, the staff answered my questions in a helpful, kind and honest way. You know, the way you would like them to be answered. And yes, it is nice for a change. Manitoba from the Sky Car. When traveling by plane, I am a fan of the short-polite-introduction-conversation followed by the shh-I’m-watching-a-movie kind of trip. On the train, there’s time for quiet and there’s time to chat. I most fully realized this as I went for breakfast my first morning on The Canadian, somewhere between Felix and Foleyet, ON. 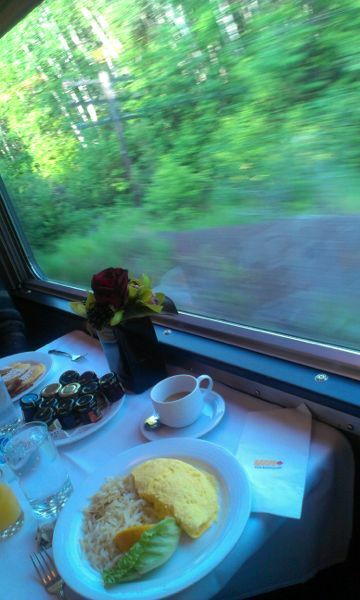 As I arrive at the dining car, the hostess greeted me and seated me at a white-linen draped table. A young advertising agent already seated, and I was followed by an Australian backpacker and a retired teacher. The meal experience was intended to be shared and we all engaged in conversation with a politeness and new interest that seemed almost lost in today’s travels. It felt civilized, if I’m not too young to use that turn of phrase. To top it all off, the breakfast, hot and tasty with a reasonable price tag, was served with the staff prowess of pouring coffee effortlessly with the train’s unpredictable turns. A brief stopover in Toronto. I boarded ready to be bored. And productive! Instead, I was engaged and read only one-half book. Eventful as the trip was, there are certainly moments of daydreaming and the train offers a wonderful, innately on-board feature – the landscape. It’s impressive. 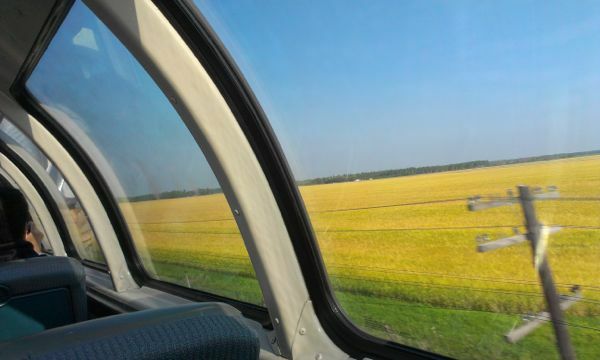 From the bustling St. Lawrence Seaway to dusty downtown Toronto to the golden Canola fields of Manitoba, the train’s windows provide stunning vistas. Canada from east to west. Canada from the pioneer point of view. As one landscape fades into another, for days in a row, I was left in awe of the gigantic country we live in. And I didn’t even get to theRockies (but I will!). 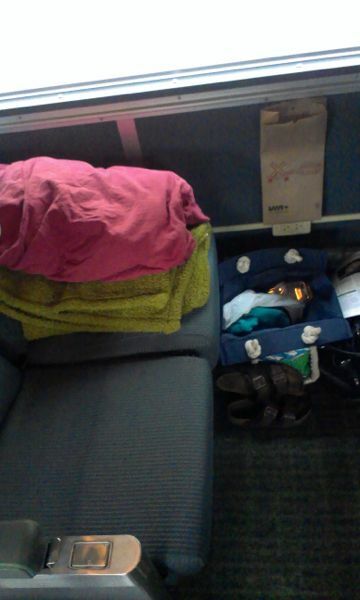 Slowly, the views got darker and for four nights, I curled up in my train abode. I asked about seating, hoping I could take two seats to myself and the attendant noted, “You go right ahead, you’re in the long-haul train, here”. My, didn’t I feel that much tougher – going the long haul. Surprisingly, sleeping wasn’t too tough. This may because I’m a good sleeper, am travel-sized or because I took heed of the great advice “bring a sleep mask, it’s essential!” There was something comforting, and almost ferry-like, in the rumble and movement of the train. That said, the all-night safety lights and morning kiddo screeches lent to an imperfect sleep. But hey, that’s coach in the long-haul, right? All in all, if you’re looking to travel in a more relaxing, low-impact and highly enjoyable way, try the train. You might just like it. For me, I arrived in Edmonton, safe and sound with my life and bike in tow. I had had 89 hours to mull over and mentally settle into this new adventure. In a time of real transition, I needed this uninterrupted train of thought. 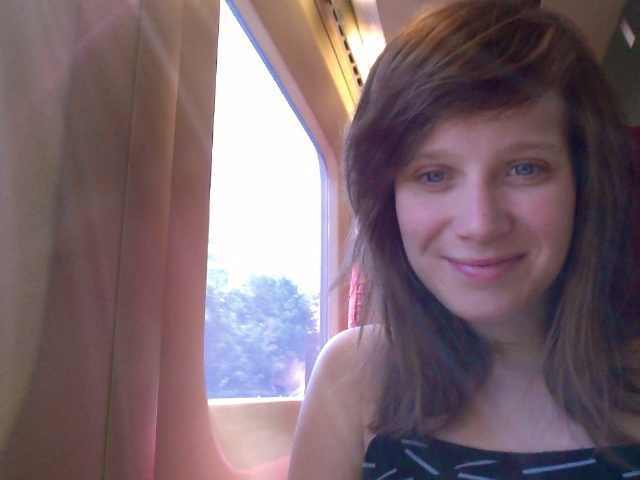 To read the first instalment of “Hannah Goes West”, click here for “Train 5703 from Truro”. This entry was posted in Out West, Women + kids and tagged Hannah MacDonald, trains. Bookmark the permalink. 1 Response to Hannah Goes West: …And There Goes Ontario! Could an early career shift to communication/journalism be in the offing?? Could there be a little of Ian MacNeil in you?? After all, Dr. Suzuki is a renowned environmentalist because of his ability to communicate issues, as much as because of his science. Don’t close any doors, as I suspect you won’t!! Again, best wishes for success and happiness, and I look forward to your posts!